Jag hade egentligen tänkt börja den här recensionen med en lång räcka svordomar i varierande grovhetsgrad. Jag besinnade mig. Men jag hade svårt att hitta ord. Jag tyckte att musiken var så vanvettigt bra att mina lingvistiska verktyg spontant inte räckte till. Efter ett antal genomlyssningar har jag nu format mina koncept och kan berätta om musiken och mina upplevelser. Superimpose är en Berlin-baserad duo, Matthias Müller trombon och Christian Marien slagverk. Nya skivan Edinburg inleds ljudsvagt men långsamt växer musiken och fyller upp varenda vrå i mitt medvetande. En hotfullt puttrande ljudvärld möter mig, allt vibrerar, så även min kropp. Jag har aldrig hört ett sådant stort sound i slagverk och trombon, till och med tystnaderna är enorma. De två instrumenten flyter ihop till ett, men även idéerna verkar sammanfogas och bli oseparerbara. Müller och Marien visar upp ett fulländat samspel och ett samförstånd som gör musiken stark och ger den riktning, mening och tydlighet, samtidigt som den är fri, öppen för tolkningar och full av chanstagningar och risker. Müllers trombon täcker upp ljudbilden med lågt smatter, torrt väs och höga skrik. Han är kraftfull, auktoritär och tydlig, utan att varken spela mycket eller starkt. Och det låter inte som Christmann, inte heller som Rutherford eller Malfatti, det låter nytt, friskt och väldigt bra. Mariens suggestivt målande trumspel är av den vansklig typ som lätt kan bli pretto och krystat men här ger det musiken lätthet samtidigt som han förankrar den i tid och rum. Mer än så här kan man inte begära av en improskiva. Superimpose gör alla rätt och resultatet är en av 2015 års absolut bästa skivor. Named after the beautiful Scottish city of Edinburgh where they recorded it on live stage – at Reid Concert Hall on March 2013, to be precise -, SuperImpose, the bicephalous project by German trombonist Matthias Muller – I already introduced his name when writing about Foils Quartet – and jazz drummer Christian Marien – the first time I heard his hits occurred three years ago on „Nulli Secundus“, another interesting release on Portuguese label Creative Sources where he performed together with Andreas Willers and Meinrad Kneer -, recently submitted this impressive live recording for Swiss label Wide Ear to my aural attention. Their session was splitted into two long-lasting (approx 18 minutes each) parts, whose experimental grip turns the listening experience of their interplay into a possible games of association of ideas and images they could evoke, where they keeps on exploring the boundaries between sound and noise, lack of rhythmical structures and rhythm. They don’t render an embryonic or primeval stage of sound, but it seems they explore the stages that immediately precede sound. For instance, the first ten minutes of „Part 1“ could give you the idea that SuperImpose translated the biological growth of some mysterious entity, so that the disarticulated percussive joints and the noises that Muller make by dampening breath and restricting modulations within his trombone could sound like the somehow ponderous steps towards a proper phrase or sound. Check it out to tickle your imagination. Seit bald zehn Jahren kultivieren die beiden Berliner ihre Synergien, entwerfen jeweils unverwechselbare Klangkosmen, schauen, was dabei herauskommt, wenn man einer freundlichen Kollision Vorschub leistet. Zwei CDs (eine aus 2006, eine aus 2009) dokumentieren bisherige Zwischenstationen, Station drei erscheint, benannt nach der schottischen Hauptstadt, erstmals auf Vinyl. Die Beweglichkeit dieser Musik bei größtmöglicher Transparenz verblüfft. Nie wird vordergründig auf den Putz gehaut, immer nähert man sich, von kleinen, zarten Geräuschen ausgehend, einander an. Die Dichte und der Spannungsgehalt, die den Forschungsreisen von Müller & Marien innewohnen, sind enorm und, das ist der eigentliche Irrsinn, gehen nirgends in diesen 37 Minuten verloren. Oft versetzt Marien die Becken in Schwingung, Müller macht sich diese auf seinem Blechgerät zunutze und verschafft seinerseits dem Kollegen soviel Luft, dass es immer nur eine kurze Frage der Zeit ist, bis die Beiden abheben und zu fliegen beginnen. Als wären sie von Marc Chagall gemalt. Eine gnadenlos gute, weil auch völlig uneitle, antiangeberische Musik zweier Zeitgenossen, die zusammen mit Clayton Thomas, der für das Design dieser Prachtplatte verantwortlich zeichnet, The Astronomical Unit betreiben. Noch so ein Meilenstein auf dem leuchtenden Pfad von Matthias Müller und Christian Marien. Man muss kein Prophet sein, um vorherzusagen, dass noch weitere folgen werden. Tahle živá nahrávka dua trombonisty Matthiase Müllera a bubeníka Christiana Mariena jde opravdu na dřeň. Začíná sice poměrně klidně jako některé jejich dřívější věci, ale poměrně záhy začíná být nervydrásající vlastně v dobrém slova smyslu, ale nesmíte v tu chvíli být zrovna duševně rozhozeni. Nicméně pokud překonáte prvotní trauma, dostanete se na chvilku do sice hlukově kolotající, ale přece jen sonické nirvány, která vám roztřepí mozek natolik, že nastane do jisté míry uvolnění, a pak si již v jejich kakofonii čvachtáte. Vzhledem k tomu, že se jedná o LP, kde má každá strana pouze něco přes osmnáct minut, máte čas na oddech. Na druhou stranu si vlastně nevydechnete ani na vteřinu, protože na vás neustále útočí jakýsi noisový bodavý hmyz, jež však nezanechává žádné boláky na kůži, ale katarzní ozvěny hluboko v závitech mozkových. Vše se dostává do mikrovírů, v nichž můžete spatřit nějaký hlubší smysl. Tolik side A.
Obraťme na side B. Tady začínáme v dronovějším duchu, ale člověk se hned nevyleká a naladěn předcházejícím dějem lépe vnímá hloubku celého díla. Asi bych to raději zažil opravdu naživo než ve ztemnělém pokoji, ale cítím smysl a všechny ty něžně bolestné zákruty. Ano, točíme se v kruhu, jímž prozařují paprsky dechových laufů i skřípění činelů. Ale že se v tom všem oba muzikanti rochní, má i svůj apel a zároveň jakousi nenaplněnou touhu, která jako by se chtěla zvednout a ona se zvedá, ovšem nemůže dojít naplnění, a tak znovu uvadá, avšak nečekanými způsoby. A nakonec cítíme, že se určitého naplnění dostalo. Je to smíření drásavých pocitů a vší té disharmoničnosti v soukolí jakéhosi zešmelcování a opětného zrození a rozkládání a znovuskládání hudebního DNA, která se kolovrátkově skládá do supernové šroubovice, jež se bude klonovat zase na nějaké jiné nahrávce, na jiném vystoupení nebo prostě jenom v myslích muzikantů či pozorných posluchačů. Co prawda mamy do czynienia z wydawnictwem z końcówki zeszłego roku, ale kogo to obchodzi, skoro materiał jest zjawiskowy. Puzonista Matthias Müller i perkusista Christian Marien oddają się bezgranicznej zabawie w stonowany, niekontrolowany improv tudzież malarstwo tembralne. Zamiast syren alarmowych i zajadłości – długodystansowa przebieżka przez sam środek ciemnej kniei. Materiał roztacza mrok, muzycy grają za spuszczoną kurtyną niedomówień, trudno mi sobie wyobrazić ich realną obecność na scenie, przemienili się chyba w spektralne nadajniki niepokojących sygnałów. Na kanwie tego misterium pojawia się przyjemność słuchania – puzon długo tkwi w fazie bulgotania, perkusja operuje metalicznymi drobnostkami i z każdą kolejną minutą napięcie sukcesywnie wzrasta. Rozładowanie następuje w dosadnej i dopracowanej architektonicznie tkance dźwiękowej. Może tak właśnie brzmiałoby wnętrze wieloryba, gdyby zapytać o to proroka Jonasza. Albo praca bebechów kurdla według relacji Ijona Tichy’ego. Przemiana materii, gulgot trzewi, chrupanie fiszbin, potworna perystaltyka. Puzon i perkusja dobierają się do wyobraźni bezbronnego słuchacza szeregiem szmerów i łaskotek. Godny polecenia trip. In Max Frisch’s “Homo faber”, a novel about an engineer who is trapped in his technological view of the world, the protagonist and his daughter Sabeth play a game while watching the Aegean Sea. They try to find as many comparisons for natural phenomena as possible. For Walter Faber, whose vocabulary seems to be restricted to the world of logical reasoning, it is hard to keep track with Sabeth, whose comparisons also include mythology, the arts and nature. Playing their game while listening to Superimpose’s Edinburgh would have been a real challenge for them. Faber might have compared the music of Matthias Müller (tb) and Christian Marien (perc) with the creaking of the floorboards in old buildings, with wind hammering against huge metal boards, with flags fluttering in a tornado or with the sounds of the machines in a huge shipyard, while Sabeth might have heard a lonely horn at midnight on a Swiss alp accompanied by an orchestra of owls, the roar of a dinosaur during mating season or the sound of a winter storm blowing over a North Sea island. In general Müller and Marien try to find a unique sound for what they do, trombone and percussion merge into one sound, maybe into the voice of a huge, melancholic animal. Since 2006 the two musicians, who are both part of Berlin’s highly creative Echtzeit scene, have been rehearsing and touring intensively and they have been trying to develop their own musical grammar and syntax. Standing on the shoulders of giants like Albert Mangelsdorff and Paul Rutherford, Müller – one of the most interesting European trombonists of his generation (and possibly the most under-estimated one) – has always been pushing the limits of his instrument and he has also been exploring the possibilities its sound, for example in his Going Underground project with Chris Heenan and Nils Ostendorf with which they play in caves in order to “to create a space for a fuller aesthetic involvement with the audience by re-thinking notions of musical space and place using the caves as both a site of artistic experiencae and as an aesthetic source from which it springs”. He tries to establish something like that with Superimpose too, and in Christian Marien he has an ideal partner, who uses his “drum kit” not to create any kind of pulse but to invent unusual and unheard sounds (see the video below). The result is music which is extraordinarily clear, intrepid, focused and deep, because the musicians understand each other intuitively. Those who like sound excursions á la John Butcher should definitely give this album a try. 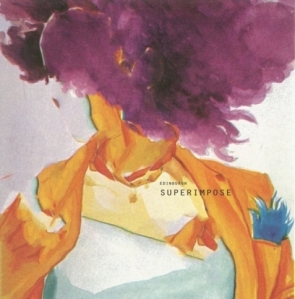 Since 2006 Superimpose has been the on-going improvisation concern of Matthias Müller on trombone and Christian Marien on drums. They both are based in Berlin, but of course get around, such as to Edinburgh. They have had CDs on Creative Sources and Leo Records. Their goal is to create one sound from two such diverse instruments. That is an interesting approach, I’d say, and on this recording from March 2013 we can hear that they understand very well how that works. What they do is part and parcel of the world of improvisation and in whatever else they do this shows even more, but when I started to play this record (and before looking at the cover, information and such like), I noted down ‚minimal, dense sound‘ and pretty much that’s what this record starts with: sounds that are very close to each other, like an exploration of a surface through the use of sticks, or objects upon objects, picked up from very close by with a microphone. A low-end rumble, but slowly the two instruments start to diversify. I think that’s something that can hardly be avoided, but that also adds to the beauty of the music. The B-side (both are untitled) here is the one piece that is more improvised in a more traditional sense, whereas on the first side this seems less the case – a more abstract use of instrument, I think, although they don’t always take it to the extreme as some of the colleagues do. This is a very good recording of some highly imaginative improvised music, perhaps not always the ‚one sound‘ they would like to achieve, but nevertheless something quite exciting. Einer allein hat keine Chance gegen die Kreativität von Tausenden. Seit ich bei Christian Marien zuletzt hinhören konnte, sind fast zwei Jahre vergangen. Nicht ganz zufällig war da auch Matthias Müller mit dabei, als The Astronomical Unit mit Clayton Thomas. In the meantime hat Marien mit Jörg Schippa’s UnbedingT, dem Benjamin Weidekamp Quartett und Frank Gratkowskis Z-Country Paradise mal mehr, mal weniger seriös getrommelt. Und Müller, ‚unser‘ Tingtingk-Müller, hat mit dem deutsch-englischen Foils Quartet, im Posaunenenduo mit Matthias Muche und in Satoko Fujiis Orchestra Berlin die Backen aufgeblasen. Wobei das nur ihre Fingerabdrücke im Paralleluniversum der Tonträger sind. Edinburgh (WER014, LP), gleichzeitig der Umstieg des Züricher Labels auf Vinyl, zeigt nun die beiden wieder in ihrer langjährigen Partnerschaft als SUPERIMPOSE bei einer Dienstreise nach Schottland. Als eine grummelnde Dampfmaschine, die das Produkt einer Fröhlichen Wissenschaft zu sein scheint. Marien tüpfelt einen vielgelenkigen Klingklang, Müller öffnet Ventile, wuppert und röhrt. Dann ein Riss, Müller schmaucht, Marien streicht an der Hörschwelle und bringt dabei einen Flötenton zustande, der sich mit einem langgezogenen Zirkularatmungsdrone vereint. Da geht das Ein-Klang-Konzept der beiden perfekt auf. Müller grummelt so nachdrücklich wie vorsichtig, Marien wischt, als wollte er diesen Ton als Curlingstein ans Ziel bringen. Die B-Seite beginnt schmauchend und träumerisch brummend. Das könnten jetzt auch zwei Kontrabässe sein, die auf Nullniveau runter graben. Dann wieder Gegrummel zu Reibelauten, die Marien flockig aufraut. Müller beginnt zu schnuppern und leise zu knurren, mit fast animalischem Anstrich, während Marien dazu an Blech schabt. Bis die beiden, jeweils flattrig, sich wieder nahezu Ton in Ton treffen. Mein Maulwurfsblick dazu von einem der sieben Hügel auf Edinburgh explodiert im Farbenrausch, den Clayton Thomas aufs LP-Cover gegossen hat. Czas na wydawnictwo Edinburgh, czas na koncert! Prawie pięć lat później – marzec 2013. Dwa epizody, każdy trwa 18 minut. Part one. O ile gadana płyta była intensywna i dynamiczna, o tyle koncert toczyć się będzie o tempo wolniej, jakby wyższe stadium wtajemniczenia w duetowy incydent improwizowany. Z otchłani ciszy dociera mikroprychanie puzonu, jakby w opozycji do dudniącej perkusji – talerz i werbel w stanie drgania, rżenia i tętnienia (z kajetu recenzenta: już w piątej minucie akustyczny orgazm!). Gęsta narracja, instrumenty na styku. Puzon, niczym pompa ssąco-tłocząca. Perkusja – stado koni w galopie. Improwizacja pięknie się dynamizuje, a eskalacje obu instrumentalistów są pieczołowicie kompatybilne i estetycznie zbieżne. Masywna pulsacja dwóch akustycznych ośrodków zapalnych. Wyciszenie w okolicach 8 minuty, to majstersztyk dramaturgiczny! Czas zatem na wytrawne sonore. Onirycznie, zmysłowo – Christian rezonuje, Matthias sygnalizuje chęć wydawania czystych dźwięków. Piękna fonicznie post-elektronika. Crazy game! Nieco ambientowa, dronowa, kompulsywna narracja, zupełnie pozbawiona jazzowych naleciałości. Puzonista drży i nadyma się, jak purchawka, w imponującym wszak tempie. Drummer szczotkuje grzbiet rumaka, ogiera monstrualnych rozmiarów. Finał fragmentu perfekcyjnie urwany. Part Two. Szum zatrutego ropą oceanu. Statki i tankowce osiadają na dnie. Narasta akustyczny dron, który nie weźmie jeńców. Solid rock! Sonorystyka Matthiasa wchodzi na szczyt. Recenzentowi aż trudno uwierzyć, że po drugiej stronie sceny dokują jedynie dwa instrumenty bez jakichkolwiek amplifikacji. Dron wybrzmiewa boleśnie i przekształca się w mikroincydenty, kreowane przez obu muzyków. Po chwili znów lepią się do siebie i kompulsywnie kopulują! Zwarta, gęsta od potu, mroczna i tłusta rozmowa dwóch niedźwiedzi w cieczce. Jak oni to grają… aż chciałoby się zobaczyć, jakimi metodami osiągają takie efekty foniczne! Dmą i dudnią na potęgę, bo niechybnie czas na finał koncertu. Improwizatorska, istotnie niemiecka dyscyplina święci triumf! Perfectly! Splendidly!